Pinterest may be well known for being a social media hotspot for foodies, aspiring interior decorators, and brides-to-be, but the platform’s influence on e-commerce and it’s ability to drive web traffic are making it increasingly attractive to brands and businesses. According to a study conducted by Millward Brown Digital and Pinterest, 93% of users reported using Pinterest to plan for purchases. Pinterest is a natural fit for brands, providing the opportunity to market products and services before purchases occur, to an audience who is actively looking for information that will help guide their decisions. We’ve written about how businesses can be successful on Pinterest by leveraging popular content categories, creating themed boards, pinning about customer success stories, and empowering their employees to actively use the platform. Implementing these Pinterest strategies can have a positive impact on your business goals, but it can also present a few challenges. Content creation and lengthy approval processes can take up valuable time and resources, so you need a solution that makes it easy to integrate Pinterest into your daily social media workflow. Hootsuite has integrated with Tailwind for Pinterest, enabling you to seamlessly manage your Pinterest activity from the same dashboard as your other social networks. The Tailwind for Pinterest app allows you to create new Pins, schedule drafts for later, or Pin to multiple boards at once—all from within your Hootsuite dashboard. 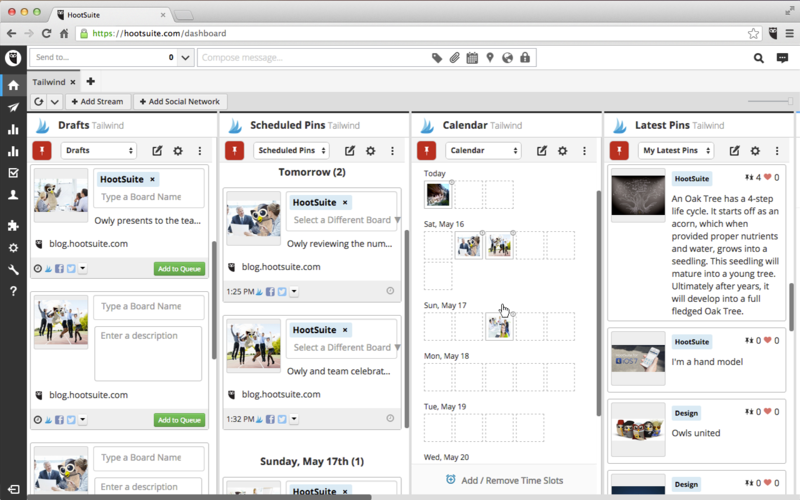 Save time by pinning to multiple boards at once, scheduling Pins, creating publishing queues, and managing your draft Pins—all from one dashboard in Hootsuite. Maximize your reach by creating an optimal Pin schedule based on when your audience is most engaged. Streamline your workflow by coordinating your Pinterest activity alongside your other social media networks from one centralized dashboard in Hootsuite. The Tailwind for Pinterest app is available in the Hootsuite App Directory for joint customers of Tailwind and Hootsuite. If you’re not yet a Tailwind user, you can start a free trial account when installing the Tailwind for Pinterest app in Hootsuite. New users of Tailwind get their first 100 Pins for free.